CHARLOTTE, N.C. (AP) – Superman is headed for the Super Bowl. 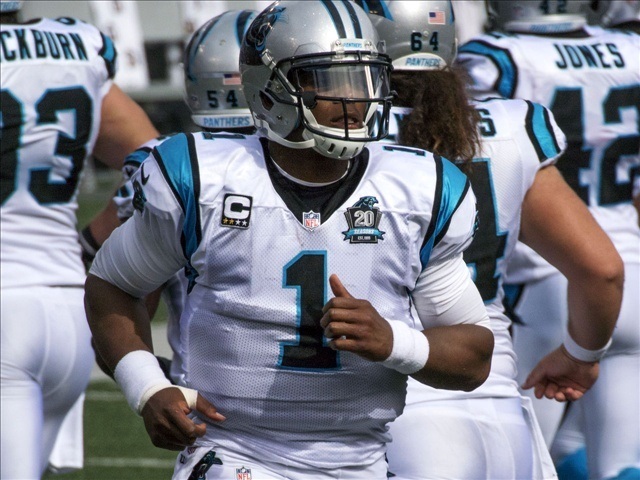 The NFL’s new top man at quarterback – Newton is an All-Pro this season – will lead the Panthers against five-time MVP Peyton Manning and the Denver Broncos in two weeks. When Newton flew into the end zone for a 12-yard third-quarter touchdown – no, he didn’t have a cape on – he posed like a superhero, dabbed a bit, and pointed the Panthers toward the Bay Area and Super Bowl 50. Capping the barrage was Kuechly, who returned an interception 22 yards for a score. The 49 points were the most this season for Carolina, which led the NFL with 500 points. The last time a team scored as many as 49 in a conference title game was 1990, when Buffalo beat the Los Angeles Raiders 51-3 in the AFC. The scoring started quickly, as it did for the Panthers against the Seahawks. Newton hit four passes for 35 yards on their opening drive and Graham Gano hit from 45 yards for a 3-0 lead. Criticized for being too conservative in the passing game in the overtime victory against Green Bay a week ago, Palmer let it fly from the outset. He just connected too many times with the Panthers. Ginn’s 32-yard punt return set up the Panthers at the Arizona 49. Six plays later, he took a pitch from Newton, headed left and broke a tackle by Justin Bethel. Just as quickly as he was surrounded by red shirts, the swift Ginn emerged to cut across the field into the end zone for a 10-0 lead. Nearly as swiftly, it was 17-0. On third down from his 14, Newton fired a dart to Philly Brown. Another botched tackle, this one at the Carolina 47 by Rashad Johnson, left Brown with nothing but unprotected turf. It didn’t get any better even when Arizona finally moved the ball into Carolina territory, only to see Kawann Short sack Palmer and strip the ball. The Cardinals kept trying, and put together a 79-yard scoring drive on which David Johnson starred after an ignominious start. He was plastered by All-Pro linebacker Thomas Davis for a 6-yard loss on the first play of the series, then came back to gain 25 yards, including a 1-yard TD dive. Davis, who already had six tackles, left for good with a right arm injury during that drive. Peterson made a huge muff trying to field a punt later in the second period. Jonathan Stewart ran for 17 and 23 yards – more missed tackles by the Arizona defense – and Newton leaped to extend the ball over the goal line from the 1. Newton’s counterpart, Palmer, was performing like anything but a Most Valuable Player. On Arizona’s first play after Peterson’s muff, Palmer was sacked by Charles Johnson and fumbled. Newton gave it back when Peterson picked him off and ran 72 yards to the Carolina 23 – and Palmer gave that one back with a weak throw that Kurt Coleman intercepted in the end zone. At one point, the Cardinals had turnovers on three consecutive plays: the muff, Palmer’s fumble, and Coleman’s first of two picks.